Walk to everything! 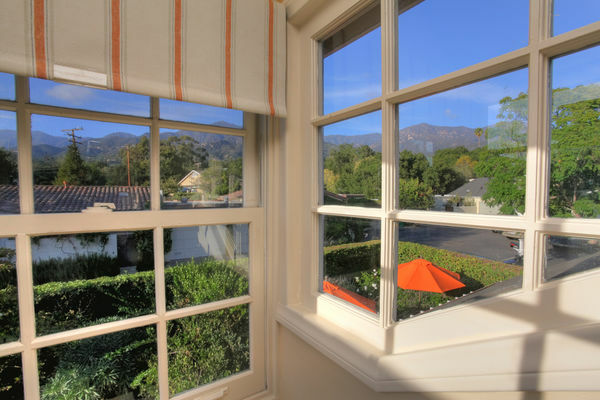 This charming 2 BR, 2 BA home in Montecito’s upper village, feels like Provence with luxury amenities and great privacy. 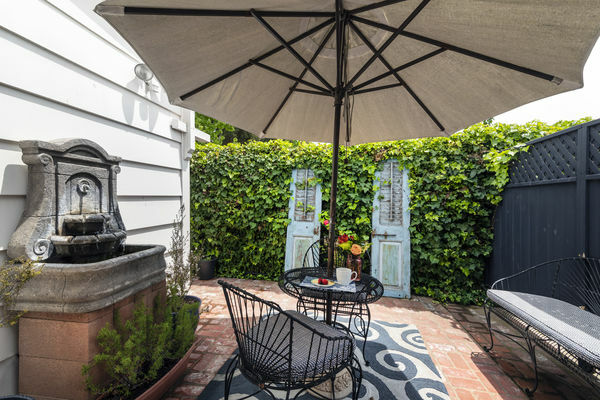 Yet it’s just a short walk to Montecito Wine Bistro or Pierre LaFond where you can enjoy a cappuccino, a glass of wine or leisurely meal along with shops, art galleries & other boutiques. 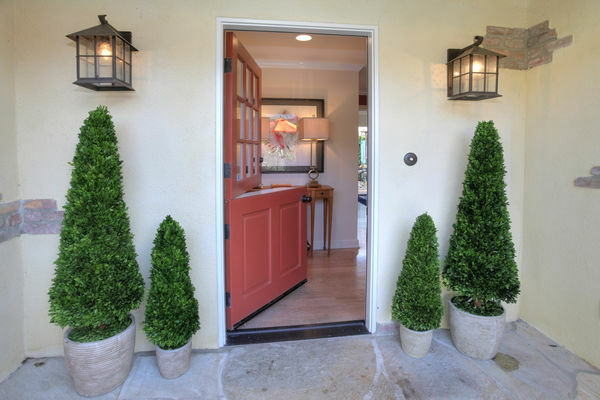 Once you enter the front gate, you’re in a Mediterranean garden with fountain, sounds of nature and hummingbirds plus panoramic views of Montecito peak. 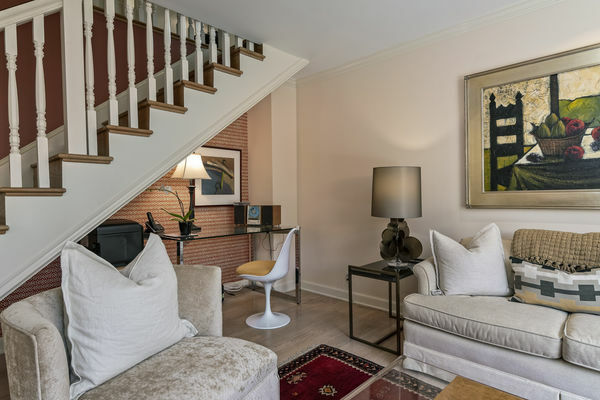 This condo home, meticulously updated in 2017, includes a 2nd bath, with hand-made tile, full size tub and marble limestone floor, separate walk in closet and central air. 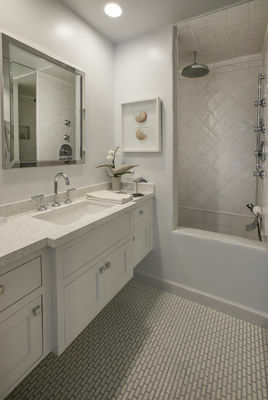 It has been recently upgraded to include 2 Master bedrooms, each with queen size bed and en-suite bath. 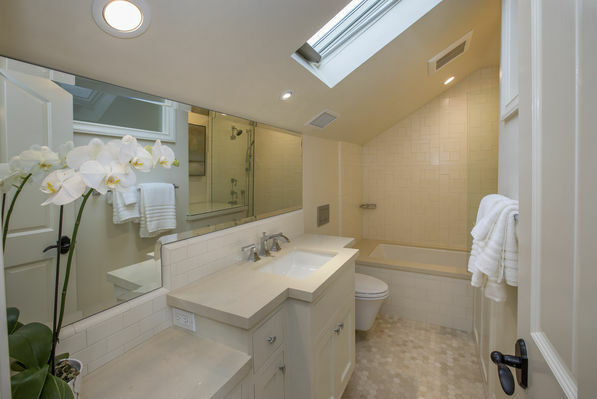 The upstairs loft suite offers full accomodations including a mini bar refrigerator and microwave. Note that privacy of the upstairs loft is afforded by the stairwell and position of the queen sized bed. Other luxury amenities include a Samsung ArtFrame TV in the living room which looks like artwork when off, plus SONOS speakers that are placed throughout the home, along with Alexa for your convenience. It’s also less than 2 miles from the famed Butterfly Beach! The living room is a very comfortable space to unwind after a long day, with plenty of indoor and outdoor space for entertaining and relaxing, and opens onto a private patio. It has a new dining table seating 4-6, and new flat screen TV. 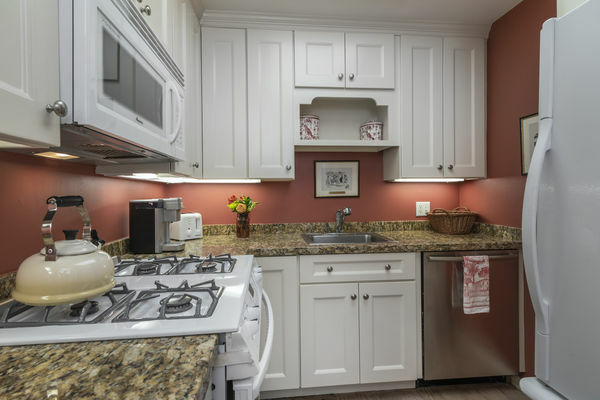 Its fully stocked kitchen has all the cooking essentials for enjoying meals at home. 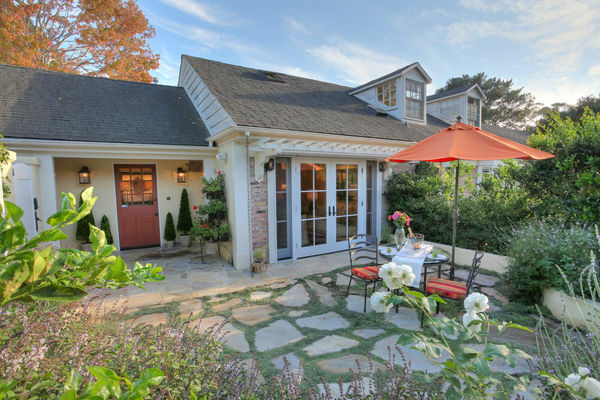 Dine indoors or alfresco in the garden for a true Santa Barbara living experience! 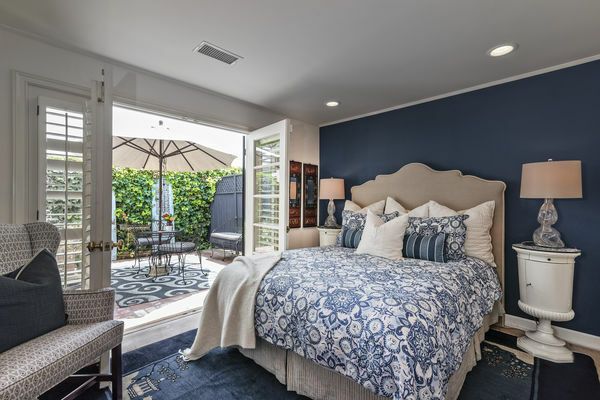 The master bedroom downstairs offers ultimate comfort with plush queen-size bedding and full bath with soaking tub and overhead rain shower. There is also a new flat screen television in this room. 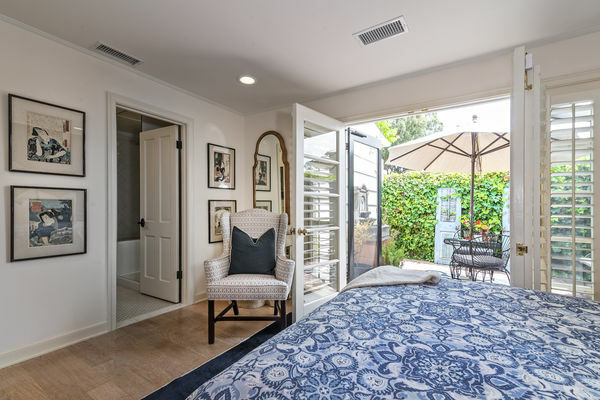 Savor breakfast or tea with morning or late afternoon coastal breezes from a second private brick patio, located off this room. The upstairs bedroom loft is newly appointed with a queen-size bed that sleeps 2 comfortably, flat screen TV, plus seating area with antique drop leaf table where you can work, or enjoy a late night snack. 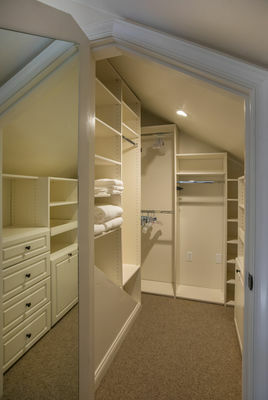 It includes full bath and walk-in closet. This room is equipped with its own under-counter refrigerator and small microwave. If you need to work, there’s a mini-office in the living room with high speed internet, dedicated WiFi and all-in-one printer. There's also a state of the art washer and dryer in the garage, plus two parking spaces. The driveway accommodates one car plus another space next to the driveway is available for an additional vehicle if needed. 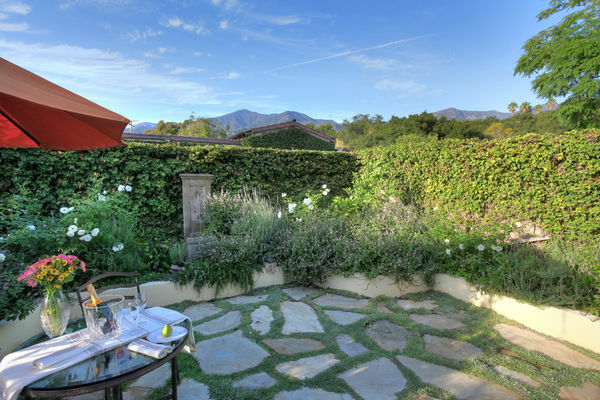 Santa Barbara Vacation Rentals is partnered with Key Concierge who will reach out to you once you have booked your reservation. 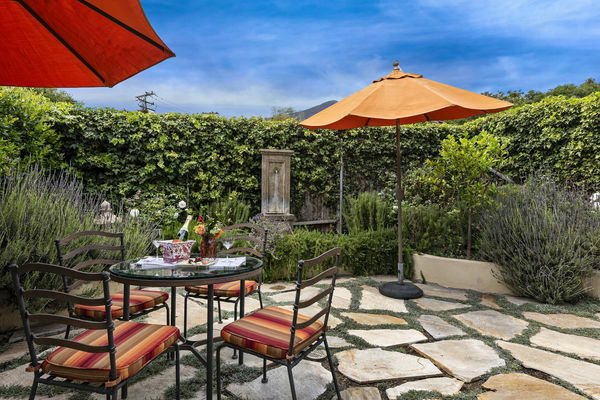 They can stock the home with groceries prior to your arrival, arrange for a private chef to cook your meals, schedule massage therapists, wine tours and so much more. Our goal is to make sure you leave your vacation with memories that will last a lifetime!